Heavy Duty Class (H), for use in carriageways and capable of bearing wheel loads of up to 12 metric tons or 135KN. 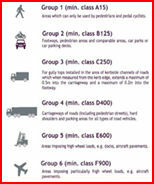 Medium Duty Class (M), for use where heavy commercial vehicles have no access, i.e. vehicles having the wheel loads exceeding 40KN, typical use would be in domestic accesses, pavements and cycle tracks, etc. 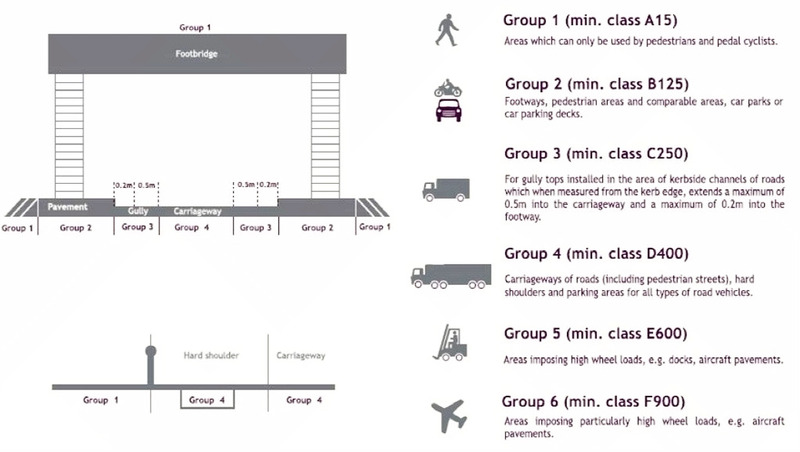 Light Duty Class (L), for use in situations where wheeled vehicles have no access and the loads applied will not exceed 7KN. Wuzland® and Primus® manhole covers are classified into the same duty classes according to SABS standards, but more details of Duty Classification for our manhole covers are specified. Primus® and Wuzland® BMC manhole covers, trench covers, sewer and drain covers, gully gratings as well as grids inlets were approved and certified by either SABS or EN124 and our manufacturers were granted the ISO9001 Certificates. EN124:1994 is a standard of European union for manhole covers, here we only discuss its duty groups. EN124 classifies the duty of manhole covers into A, B, C, D, E, F grades such as A15, B125, C250, and D400 in which the testing force is applied at 15KN, 125KN, 250KN and 400KN respectively, etc. 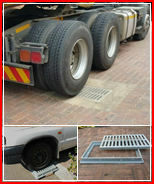 Each grade or duty group of the manhole covers is recommended to use in certain areas, to view the IMAGE for details. EN 124-6 Gully tops and manhole tops made from polypropylene, polyethylene or non-plasticized poly vinyl chloride. BS EN124 is the standard published by British Standards Institute, the content is the same as EN124. The Standard of EN124 is widely used worldwide and now its EN124:1994 is recognized by SABS as SABS SANS 50124:1994. A special weight tolerance test of our Primus® 2A Heavy Duty Covers was required by XCMG Africa before their purchase order was placed for their special usage of the covers in a exhibition show of their cranes. Four 2A covers were placed respectively under the four lifting devices/stands of the crane of which nett was 43000 KG. The crane was lifted away from the ground completely and held for about 15 minutes. Both sides of the covers were tested, no damage was found in the covers. Many thanks to XCMG Africa for the testing. Our Medium Duty 150KN 750x450x45 Gully Gratings were installed on the driveway by a client who would not expect any heavy vehicles to access there. After heavy container trucks (gross weight at least over 30 tons) drove over the gully gratings several times safely, the client was happy and took the photos to send to us. We were grad to know the quality of our product to be tested, however the client had to be advised to avoid such heavy trucks passing over the cover, which could shorten its lifespan. We also strongly recommended the client in such situation not to allow the truck to park with its wheels right onto the cover for a certain time, which could cause damage to the cover. Many thanks to Muhammad who sent us the photos. Please be advised that the methods used to test the covers are different in these standards mentioned above, i.e., the same testing figure of force applied to the manhole covers in the tests of different standards does not mean the same weight tolerance or load capacity of the manhole covers tested, which usually causes confuse on the duty classes specified by the standards. Certainly with the development of polymer manhole covers by the fast growing technology in the industry, there come some newer products such as SMC and FRP manhole covers, which are lighter in weight, however they are still quite expensive by now, so the BMC manhole covers are still popular in the near future. Compared with iron cast and cement manhole covers, Polymer concrete or BMC manhole covers have more advantages with which BMC or Polymer manhole covers may take the lead in the market and finally replace the other covers completely in the future.